If you love cupcakes, then you'll really love gourmet cupcake recipes. Each of these unique cupcakes goes beyond your average cupcake into the sublime. Try one of these tasty recipes for a little bite of heaven. Cupcakes are all the rage right now, and that shouldn't come as a surprise. Many people consider cupcakes to be the ultimate dessert: a single dessert serving that is packed with flavor and aesthetically pleasing to look at. Not only that, but cupcakes are the perfect portable dessert, and can easily be packed for a picnic dinner or tucked into your sweetie's lunch bag. In the past few years, bakeries have started bringing cupcakes to the forefront of their offerings - but not just any cupcakes. Instead, there are cupcakes that feature interesting flavors like cardamom or beer. There are even bakeries like New York's Babycakes Vegan Bakery that specialize in gluten-free and vegan cupcakes so that those with special dietary needs can get their cupcake fix. With options like that, cupcakes have suddenly gained a broader appeal than ever before. If you have Celiac disease or a gluten sensitivity and never thought you'd have a cupcake again, then rejoice! The Babycakes cookbook allows you to bake gluten-free and vegan cupcakes in your very own kitchen. Epicurious is a great source to find cupcake recipes. Attention beer lovers! Try this recipe for Guinness Cupcakes with Bailey's Irish Cream Frosting. 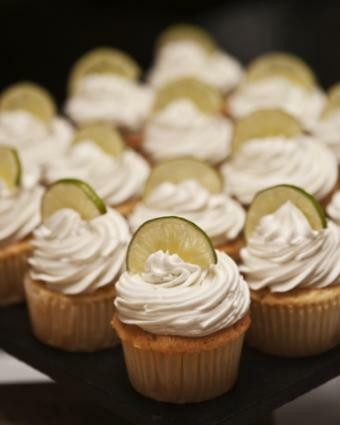 Here's a fruity recipe for Olive Oil Cupcakes with Meyer Lemon. Everyone's favorite cookie has become a cupcake! Give these Snickerdoodle Cupcakes a try. Try every one of the over 130 cupcake recipes in the Wild About Cupcakes cookbook. These cupcakes have a delicious, light texture and are perfect when paired with ice cream or delicious homemade gelato. Preheat the oven to 275 F and prepare your cupcake pans. Line the pans with standard cupcake liners; you will need enough cupcake tins to make 22 cupcakes. Set a heatproof bowl over a pan of simmering water and melt the chocolate and butter together, stirring until smooth and completely melted. Remove the bowl from the water and allow the chocolate and butter mixture to cool slightly. Whisk the egg yolks into the chocolate and butter mixture until well combined. Beat the egg whites until they form soft peaks in a separate mixing bowl. Start to add in the sugar gradually, beating the mixture constantly once soft peaks have formed. Beat until all of the sugar is incorporated and stiff peaks form. Whisk 1/3 of the beaten egg whites into the chocolate mixture until just combined. Fold the chocolate mixture into the remaining egg whites, being careful to retain as much volume as possible. Divide the mixture evenly among 22 cupcake liners. Each should be about 2/3 full. Bake for approximately 25 minutes, until the cupcakes are just set in the center. Remove the cupcakes from the oven and set them on wire racks to cool. As the cupcakes cool, the centers will crack and sink. Serve the cupcakes either slightly warm or at room temperature with a small scoop of ice cream where the center sank. Whether you try the recipe above or one of the many amazing online or cookbook recipes, you're sure to find the perfect cupcake to please your palate.